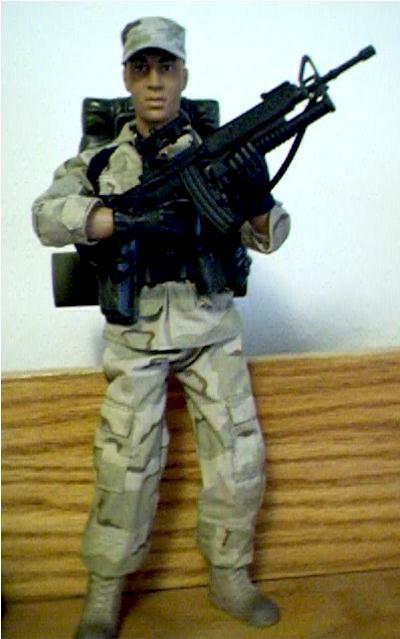 Tonight's guest review is from Hutt Wigley, a man who likes his figures like he likes his coffee - sixth scale, and wearing camo! The Power Team line is a very cheap alternative to Joes, 21st Century, and others, and tonight Hutt is looking at the new Peacekeeper Ranger. Take it away, Hutt! It's a box, camouflage colored, with a windowed front. The subject matter and accessories are displayed well, and a good variety of the action figure range is featured on the back. As with ALL my figures though, the box is only a temporary stasis chamber, where the figure rests until he/she is called upon for action! He's actually got a fairly decent head sculpt. In the package, my first impression of the head sculpt was "he sorta looks like Vin Diesel". 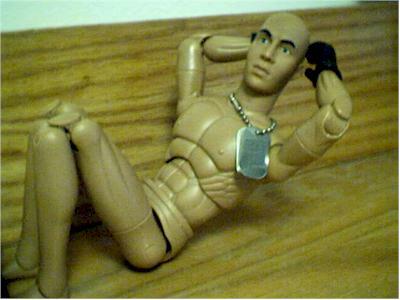 Now, after getting him out of the package, he reminds me more of Coby Bell (Officer Davis from "Third Watch") with a bald head. His only paint appears to be his face: eyes, eyebrows, lips, and slight coloration to the cheeks. Not an outstanding example for the industry, but not totally lame either. This is a tough score to give. On the one hand, he's got all the double-jointed elbows and knees the you'd come to expect from the industry. (He's got a total of 35 points of articulation.) But some of his articulation is pointless and redundant. For instance, he's got cut joints in his biceps, cut joints in his wrists/hands and this weird peg-rotating joint in his elbow/forearm area. He has a similar joint in his knees. The latter helps to compensate for his lack of ankle rotation, but enables his knees and elbows to bend at the strangest angles! His hands are molded gloves with only wrist rotation for movement. The hands are smaller, and therefore, more realistically proportioned then previous figures from this line. 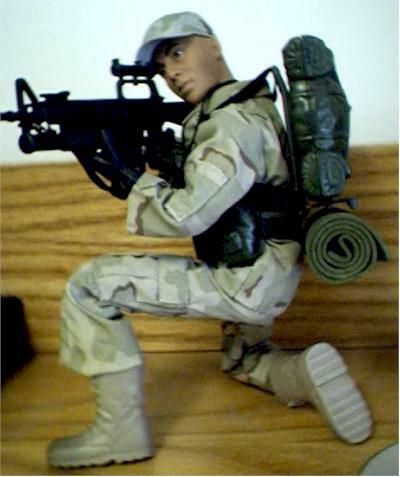 The "Ranger" figure has a decent variety of accessories: An M203 rifle/grenade launcher with a detachable scope & spare ammo clip, a molded plastic backpack with an attached foam-rubber bedroll, a web belt, 3 different molded pouches, a molded canteen, binoculars, and a swell 3-color desert camo fatigue cap! 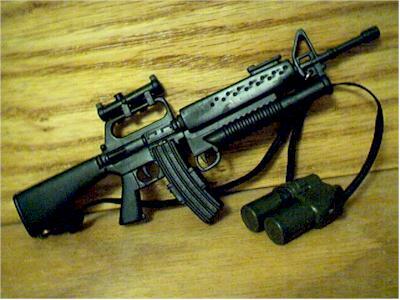 The rifle is not very detailed, and looks extremely "toy-like". 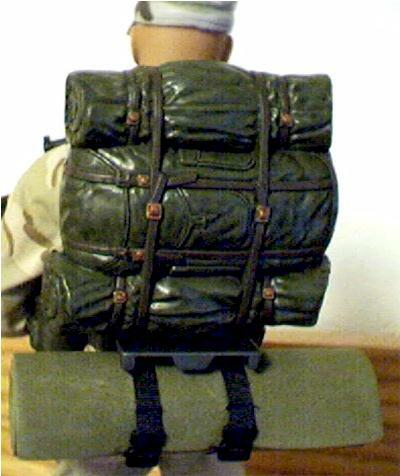 The pouches for the web belt don't really follow any particular rhyme or reason (a matching pair of both ammo pouches and canteens would have been more in order!) 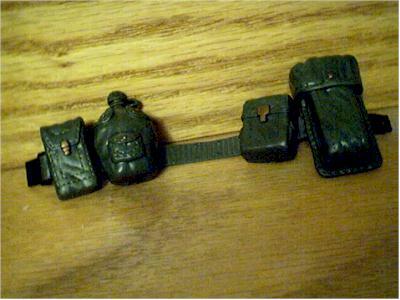 The painted details on the pouches and the molded backpack were very well done. The molded fatigue cap is among the best I've seen! It fits snuggly on the dome, and the paint camo scheme paint colors matche his uniform well. Okay, the 3-color desert camo fatigues are among the best 1/6 scale fatigues I've ever seen! The colors are superb, the stitching is excellent, the details are true-to-life! However, I gotta drop off a star for the boots! Although the boots more detailed, feature a modest attempt at weathering, and are a definite improvement over M&C Toys previous Power Team boots, they are still pretty basic! They still lack a definitive "right" and "left" in their pairing, and make the figure's feet look awkward. For consummate kit-bashers, however, the fatigues alone are certainly worth the $7.99 total price of the figure! It's a rarity to be able to purchase a figure with this much articulation, this much uniform detail, and this many accessories for under $20. Rarer still is scoring one for under $10! With "Peace Keepers" carded uniform sets featuring the same uniforms as the boxed action figures retailing for $6.99, Buying the complete figure for only $1 more make complete sense! The price point would also appeal to kids who will make use of these figures in backyards and sand boxes as well as to adult customizers. There are only a few small let-downs for this figure: The lame boots, the cheap looking rifle, and the mix-match ammo pouches. The figure is a bit taller than the Classic Collection GI Joes I'm used to, so he would add some decent variety for those of you who create custom teams or squads. However, his head is rather large and bulbous, so I'm afraid most other 1/6 scale brands of headgear won't fit on his big knot! Kay Bee Toys and Big Lots discount stores are your best bets! 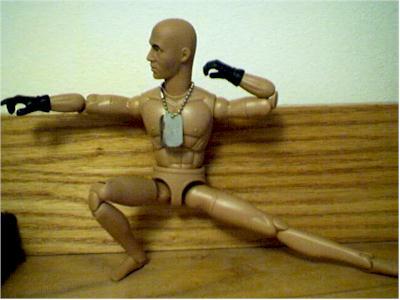 first G.I Joe when he was three years old. 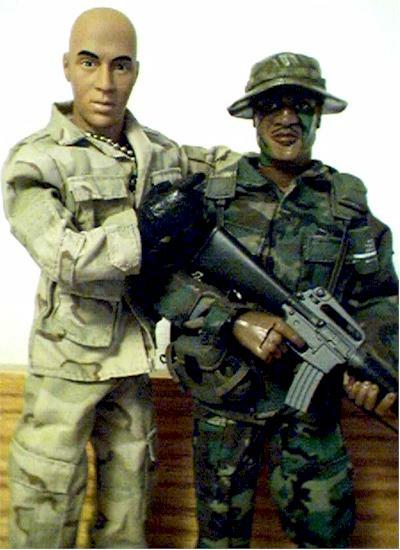 Growing up his father was in the army and it gave him inspiration to create adventures for his own action figures. Hutt began to seriously collect G.I. Joes when his father gave him the Timeless Collection G.I. Joe and "The Story Behind The Legend" book on his 30th birthday. Since then his collection has over 150 12" action figures. As a father himself, he now creates adventures for his son's and his own G.I. Joes. Figures from the collection of Hutt Wigley.